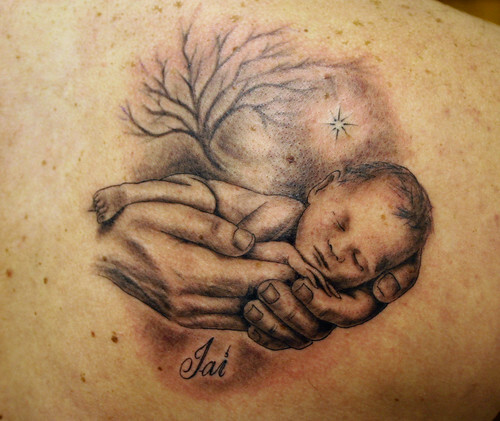 The most common in loving memory tattoo designs are the religious images like cross and angel. The cross is usually intertwined with a heart or rose symbols or "RIP" initials for rest in peace. The date of the death and name of the person are also included in the whole tattoo images as if re-creating a gravestone on their body. Angels are another preferred image as representation of the person who passed away and are commonly placed on the shoulder blade as if symbolizing guidance or protection. Butterflies are also being used by some since during the old days, they are believed to be reincarnation of the soul who passed away. Other figures that are being utilized for this purpose are stars and cherry blossoms which in Japan stand for fleeting moment in one's life. * Coping with the death of a loved one is melancholic enough so it does not necessarily have to be a gloomy "in loving memory tattoos". * It can be anything from a hobby or favorite flower. * It can be an adorned painting or title of a song most frequently sung. * The key is to think of something that will remind you the most of that person you love. * It might be inconceivable to realize that you can't be with this loved one anymore so go for a design that will bring memories to life . * Choose a design that will bring a smile to you instead of sadness.